As I was watching the news, there they were, a group of gay activists pouring Coca Cola down the gutter in front of the company’s global headquarters in Atlanta. This was the US gay community’s way of protesting the poor treatment of gays in Russia. “But, what did Coke have to do with the Russian government’s poor treatment of gays?” one might ask. Well, in a few days, Russia is hosting the Winter Olympics, and as usual, Coca-Cola is sponsoring the American athletes participating in the games. 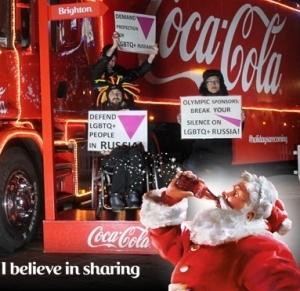 The protesters were urging the company to call for a repeal of Russia’s anti-gay laws before 2014 Winter Olympics.According to the group, more than 140,000 All Out members sent messages to the company’s CEO urging Coca-Cola to speak out against Russian anti-gay propaganda. As I watched the news report, I marveled at the US gay community’s support for the persecuted gays in Russia, and began to compare their action with the US evangelical churches reaction to the worldwide persecution of Christians. By the way, the issue here has nothing to do with one’s acceptance or rejection of the gay lifestyle. However, it has everything to do with opposing oppressive governments, or regimes that persecute, mistreat, or harm those who believe the same as you do. I did a search on the Internet to see when was the last time a group of US Christians protested to bring attention to the persecuted church around the world. I ran across a lot of articles on the subject of persecution, or articles where you are encouraged to send emails to some governments demanding the freedom of this or that Christian. There were articles about the Pope speaking against the persecution of Christians in some Muslim countries, but nothing about even a handful of Christians actually showing up anywhere in the US to bring attention to this crucial subject. Somehow, praying, writing emails, or expecting the US government to protest on our behalf should be enough. Speaking of the US government, let’s assume it was Iraq that had conquered America. Do you know one of the first things they would do? Turn many of our churches into mosques. We, not only didn’t do such a thing, but the church in Iraq is much worse off today than it was under Sadam’s regime. Governments and politicians, in general, do what’s expedient and beneficial to them. It took the US government over 1000 days before they even protested the arrest of American Pastor, Saeed Abedini in Iran. By the way, he’s still in prison. On the other hand, there was my good friend, Eddie Romero, a Chicano US pastor from Southern California, who, on behalf of five imprisoned Iranian Christians, went to Iran to purposely get himself arrested by the government and bring attention to the persecuted church. Although the Christians in general applauded him, there were some who thought he was crazy. “His action can bring more harm to the Christians in Iran,” they said. To which Eddie replied, “For too long we have stood behind the walls these governments have erected and tried to communicate with them by throwing emails and letters of protest over the wall in the hope of making a difference. I want to go in and make them talk to me face to face.” I was honored to be a part of the team that helped Pastor Eddied fulfill his goal. By the way, a week after Pastor Eddie was deported back to the US, one of the five he was protesting for was released from prison. Come dream with me. Wouldn’t it be an amazing event if the Christians in this country called a march on DC to protest on behalf of the persecuted church around the world? If for nothing else, the march will encourage all our persecuted brothers and sisters around the world to stand fast and know they are not forgotten.